What is the meaning of [the Mishnah:] “All obligations of the son upon the father”? Shall we say, all that the son is obligated to perform for his father? Are then women [i.e., daughters] exempt? But it was taught: Every man [his mother and his father you (plural) shall fear] (Leviticus 19:3). I know this only of a man. Whence do I know it of a woman? When it is said: Every man, his mother and his father you (plural) shall fear—behold, two are [mentioned] here. Rav Yehudah said: This is the meaning: All obligations of the son [that fall] on the father to do for his son, men are obligated but women [i.e., mothers] are exempt. We learned in the Mishnah what our Rabbis taught [in a baraita]: The father is obligated with respect to his son to circumcise, redeem, teach him Torah, take a wife for him, and teach him a trade. Some say, to teach him to swim also. R. Yehudah said: He who does not teach his son a trade, teaches him banditry. Banditry! Can you really think so! Rather, it is as though he taught him banditry. Becoming a parent is arguably the largest single obligation a person undertakes in his or her lifetime. But what does it entail? What do we owe our children? Every parent parents differently, and many of us look over our shoulders at how others parent and wonder if we are missing something essential. Talmud is highly invested in communal continuity and successful families. The Mishnah tells us, “All obligations of the son upon the father, men are obligated but women are exempt.” There are two ways to understand this statement: First, Mishnah intends obligations of the son toward the father; second, obligations of the father toward the son. Gemara discards the first possibility because the exemption of women would suggest that only sons, and not daughters, have such obligations—after all, Mishnah specifically exempts women. The Gemara goes so far as to quote the verse someone might bring to “prove” that the Mishnah intends obligations of the child toward the parent: Leviticus 19:3, which ostensibly speaks only of a man. Yet the very same verse employs the plural form of “you” which Gemara understands to include daughters as well as sons. This opens the way for Rav Yehudah to assert that the obligations of which the Mishnah speaks are those of the father to do for his son. Rav Yehudah explains that fathers are obligated toward their sons, but mothers are not. This immediately raises several questions: Why are mothers not obligated? What are the obligations of a father (and mother) toward a daughter? Here the wide cultural gap between the rabbinic era in both Eretz Yisrael and Babylonia, and our own time, is keenly evident. Daughters were, in large measure, financial liabilities to be married off well. They did not participate in the religious, economic, or cultural life of the community as sons did. Consider the list Rav Yehudah supplies of a father’s obligation toward his son: Circumcision, redemption of the firstborn (pidyon ha-ben), Torah learning, marriage, and training to earn a livelihood. An anonymous source adds one additional item: swimming. When the Rabbis provide a list of this sort, several possibilities lie behind it. The list might be exhaustive: these are the only hard-and-fast obligations of a father toward his son. Alternatively, the list might be a sampling, and it remains for us to analyze what principles or values generated the list—and extrapolate to other items that properly fit the list. Or, the items on the list are symbolic, each representing a category that remains to be fully fleshed out. Noting that the basics of food, shelter, and clothing are not stipulated, let alone anything connoting love and respect. I suspect that the last perspective fits. Circumcision and redemption are the entry points of the child into the community: they symbolize the child’s identity as a Jew among non-Jews, and as a Jew in the local Jewish community and larger Jewish world, connecting the child to the on-going ritual life of the Jewish people. Torah learning nurtures the child’s spiritual life and ability to derive spiritual meaning and strength from tradition. Marriage hopefully assures the son’s emotional and social well-being. A livelihood provides the means to economic security and well-being. Swimming is a curious and marvelous addition: A parent should teach a child the skills needed to stay afloat and protect oneself in a dangerous world. Gemara, unsurprisingly, distinguishes the obligations of fathers and mothers to their children, as well as those owed sons and daughters to their parents. Do you think there is any reason to make such distinctions in the 21st century? If you were asked to draw up your own list of essential obligations of parents in the 21st century, what would you include and why? There is a set of social skills Talmud values but does not instruct parent to instill in their children as a matter of obligation—after all, how can you require parents to instill character traits in their children. Among them are: self-confidence, honesty, trustworthiness, cooperation, compassion, generosity, tenacity, patience. What effective means do you recommend for transmitting these values? Daniel Goleman, psychologist and pioneer in the realm of Emotional Intelligence, describes how a teacher in Spanish Harlem taught second-grade students (many of whom had suffered trauma) to focus their attention for learning by using a meditative breathing technique. You can hear Goleman describe it here. Should parents teach this to their children? R. Yochanan said: From the day that the Holy Temple was destroyed, prophecy was taken away from the prophets and given to fools and children. “To fools.” What does this mean? It is like what happened to Mar bar Rav Ashi who was standing in the marketplace of Mechuza and heard a fool saying, “The person being appointed to lead the academy in Mechasya signs his name ‘Tavyumi.’” He [Mar ben Rav Ashi] said [to himself]: “Who among the rabbis signs his name ‘Tavyumi’? I do! This means it is a fortunate time for me.” He arose and went [to Mechasya] but by the time he arrived the rabbis had voted to appoint Rav Acha of Difti as the head [of the academy]. When the rabbis [in the academy in Mechasya] heard that [Mar bar Rav Ashi] had arrived, they sent a pair of rabbis to consult him. He kept the pair there. They sent another pair of rabbis. He held them [the second pair] there. [The rabbis continued to send rabbis in pairs to visit Mar ben Rav Ashi] until he had ten. [Then Mar bar Rav Ashi] began to teach and expound [to the ten assembled rabbis sent by the academy at Mechasya]. Because one does not begin to expound with a group of fewer than ten people. R. Yochanan asserts that since the Destruction of the Second Temple in 70 C.E., prophecy is entrusted only to fools and children. How could one possibly know whether the words of fools (the term shotim includes deranged individuals) and children are indeed divine communications or simple the product of their imaginations? And who would trust either to convey God’s will reliably? Talmud supplies two examples: prophecy from “fools” and from children (see below). Mar bar Rav Ashi hears a “fool” in the marketplace of Mechuza saying that the rabbis in the academy in Mechasya will appoint him over his rival, Rav Acha of Difti, to lead them. The manner in which the fool identifies the future leader of the academy in Mechasya is bizarre: someone who signs his name “Tavyumi,” which as far as Mar bar Rav Ashi knows, applies only to him among all the rabbis. He therefore travels to Mechasya to claim his prize, only to learn that the rabbis have just voted to appoint Rav Acha of Difti as their head. When they learn that Mar bar Rav Ashi is in town, however, they send two rabbis to secure his approval and permission to appoint his rival. Mar bar Rav Ashi, it appears, has a plan. He detains the two rabbis; when they do not return, their colleagues assume they did not complete their task. Therefore two more rabbis are sent. Mar bar Rav Ashi delays them, as well. In pairs, rabbis arrive, until Mar bar Rav Ashi has assembled a minyan of rabbis. He thereupon formally addresses them and successfully convinces them that he will be the superior leader. Mar bar Rav Ashi is appointed in place of Rav Acha of Difti. Aside from the chutzpah factor evident here, we might wonder: Did the rabbis change their minds and install Mar bar Rav Ashi to head the academy at Mechasya in fulfillment of the prophecy? Or did Mar bar Rav Ashi implement a crassly political scheme emboldened by the fool’s words? Or perhaps the prophecy provided an opening for Mar bar Rav Ashi to confidently prove his qualifications and secure a position for which he was eminently qualified? It would seem that if the fool’s words were genuine prophecy, Mar bar Rav Ashi’s fortunes would be secured without having to go through the machinations of delaying the rabbis and addressing them as a candidate for office. It appears that the Rabbis are deeply conflicted about the notion of prophecy: Does it exist at all any longer? Does God communicate directly with anyone? The notion that God communicates only to fools and children reflects the Rabbis’ sense that at least since the calamity of Roman rule in the Land of Israel, culminating in the Destruction of the Second Temple, God was far less involved with the world than previously. For them, God was distance and out-of-touch. 1. Do you believe that prophecy exists? If so, how would you recognize a genuine prophet, or genuine prophecy? There are only two ways that Rav Chisda’s daughter could marry both scholars: either she was divorced from the first and married the second, or her first husband died and she married the second man. Rava sardonically prefers being the second husband to assure that he does not die early. The Talmud understands her statement to have come to pass. Does this mean that a child acting childishly is spouting prophecy? Hardly. 3. Psychologists have explained the power of self-fulfilling prophecies in our lives. They are fueled by our expectations. Two types of self-fulfilling prophecies often seen in the educational and organizational realms are the Pygmalion Effect (higher expectations lead to increased performance) and the Golem Effect (lower expectations lead to lower performance). Have you witnessed either of these or experienced them in your life? R. Abdimi from Haifa said: From the time the Temple was destroyed, prophecy was taken away from the prophets and given to sages. Is it really true that no sage [prior to the Destruction] was a prophet? This is what he [R. Abdimi] meant: Although prophecy was taken from the prophets [at the time of the Destruction], it was not taken from the sages. Amemar said: A sage is even greater than a prophet, as it says, And a prophet has a heart of wisdom [the word “wisdom” is from the same root as “sage”] (Psalm 90:12). Which do we compare with which? I would say [that we compare] the lesser to the greater [i.e. prophet to sage]. Abaye said: Know that one great man will state something and [the same thing] will be stated in the name of another great man. Rava said: What is the difficulty? Perhaps both of them were of one destiny? Rather, Rava said: Know that one great man will state something and then the same statement will be made in the name of R. Akiba b. Yosef. Rav Ashi said: What is the difficulty? Perhaps concerning this matter, he [the first sage] had the same destiny [as R. Akiba]. Rather, know that a great man can state something and [sometime later] it will be stated as halakhah to Moses from Sinai. But perhaps [the sage came to this statement] like a blind man [finds his way] through a window. But did he not provide a reasoned explanation [for his opinion]? The claim of prophecy undergirds Torah’s authority. Moses is many things: leader, general, teacher, and prophet, but it was in his capacity as prophet that he speaks “face to face” with God and receives Torah on Mount Sinai. After the Destruction of the Second Temple (70 C.E. ), the Rabbis in both the Land of Israel and Babylonia are engaged in the enterprise of creating what we know as Rabbinic Judaism. They call it Torah she-b’al-peh—Oral Torah—and claim that it also came down Mount Sinai with Moses. This “Oral Torah” is Talmud. Talmud’s claim to authority rested on the claim that the Rabbis’ decisions reflected God’s will and opinion—a prophecy of sorts. But the Rabbis were not latter-day Isaiahs and Jeremiahs. They sat in the Study House, learned and taught the teachings of their elders, discussed and debated, considered precedents, applied rational thinking and reasoning to the issues before them, and ultimately took a vote to determine halakhah. We do not picture them as the artist Benjamin West (1738-1820) painted Isaiah, his lips anointed with fire by an angel (Isaiah 6:6), yet the idea of divine inspiration figured into their understanding of what they were doing. Since their claim to authority is based on a similar claim, rejection of receiving insight from the holy spirit would be self-defeating. Yet the Rabbis have reason to be skeptical and distrustful of prophecy: The prophet makes a claim to divine inspiration or revelation that is not open to empirical or rational examination, which is bedrock for the Rabbis. Moreover, history is riddled with false prophets. We see the Rabbis wrestling with this conundrum in Baba Batra 12a,b, both as it applies to them, and in consideration of intellectual integrity and its meaning for the community. R. Abdimi from Haifa said: From the time the Temple was destroyed, prophecy was taken away from the prophets and given to sages. Is it really true that no sage [prior to the Destruction] was a prophet? This is what he [R. Abdimi] meant: Although prophecy was taken from the prophets [at the time of the Destruction], it was not taken from the sages. Amemar said: A sage is even greater than a prophet, as it says, And a prophet has a heart of wisdom [the word “wisdom” is from the same root as “sage”] (Psalm 90:12). How do I know that means a Sage is superior to a prophet? Perhaps the verse means to tell me that a prophet is superior because in addition to prophecy, he possesses the wisdom of a sage. How am I to read the verse? Which do we compare with which? In other words: Do we compare the prophet to the sage, or vice verse? I would say [that we compare] the lesser to the greater [i.e. prophet to sage]. Abaye said: Know that one great man will state something and [the same thing] will be stated in the name of another great man. That is, the very same teaching can be attributed to two different sages who did not know one another or teach one another. How could this be unless they both have the power of prophecy? Rava said: What is the difficulty? That is: Why is this a problem? Perhaps both of them were of one destiny? The term in the Talmud is חד מזלה meaning they were born under the same constellation, suggesting that they have the same intellectual capacities. Two intelligent people can come to the same conclusion about a matter and teach the same thing; this doesn’t make either of them a prophet. Hence, it is still unproven that sages are endowed with prophetic ability. Rather, Rava said: Know that one great man will state something and then the same statement will be made in the name of R. Akiba b. Yosef. According to Rava, that something is quoted in the name of R. Akiba, whom Talmud regards as a “Second Moses”—see BT Menachot 29b—proves it has divine authority. Rav Ashi said: What is the difficulty? Perhaps concerning this matter, he [the first sage] had the same destiny [as R. Akiba]. Rather, know that a great man can state something and [sometime later] it will be stated as halakhah to Moses from Sinai. This means that he received it prophetically. [which we can attribute only to luck]. But did he not provide a reasoned explanation [for his opinion]? If he gave a cogent halakhic explanation, he cannot be considered as one who stumbled on the right answer out of sheer good fortunate and nothing more. He must have provided a well-argued reason, and this is what proves that his teaching is prophetic. Does prophecy exist in our time? Could there be anyone you would acknowledge as a prophet? Would you recognize a prophet if you saw or heard one? How? If one used an animal as a wall of the Sukkah, R. Meir declares it invalid and R. Yehudah valid, for R. Meir was wont to say: Whatever contains the breath of life can be made neither a wall for a sukkah, nor a side-post for an alley, nor boards around wells, nor a covering stone for a grave… What is the reason of R. Meir? Abaye replied: Lest it die. R. Zeira replied: Lest it escape. Concerning an elephant securely bound, all agree [that the sukkah is valid], since even if it dies, there is still ten [handbreadths height] in its carcass. material” we have never tried: an elephant. Perhaps you’re thinking: That’s crazy! It makes no sense! Or perhaps you’re thinking: There were precious few elephants in either Eretz Yisrael or Babylonia when the Talmud was written, so what are they talking about? How might we think about this passage? Examples of the carnivalesque in our society include: Reality TV, Spring Break, Homecoming, Halloween, Super Bowl, and Mardi Gras. And, of course: Purim. The Jewish scholar Daniel Boyarin applied Bakhtin’s ideas to the Talmud. The premise is absurd, but the conversation proceeds as if it were a sober, serious, significant halakhic issue under consideration: May we use an elephant as a wall of our sukkah? Naturally, there is a disagreement. R. Meir objects and R. Yehudah permits. If you feel you are in the realm of the absurd, you are entirely correct. 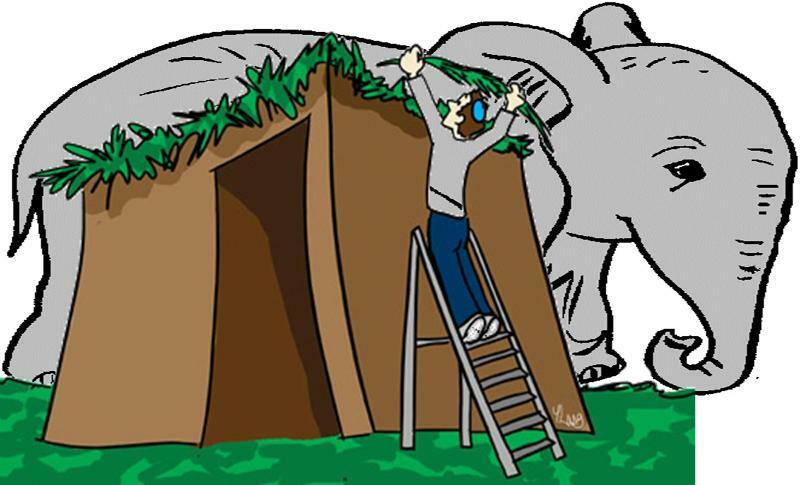 If you feel you are peeking through the tent flap into a circus—complete with canonical elephant!—you are again correct. The Talmud asks about R. Meir’s objection. Two explanations are offered: First, R. Meir was worried that the elephant would die during Sukkot, raising the absurdity level to a new high. Second, R. Meir was concerned that the elephant would escape. How, after all, do you tie down an elephant who decides he’s leaving? But perhaps we can overcome both concerns: if we can securely leash the elephant, even if he dies and falls on his side, he’s adequately tall sideways to meet the minimum requirement for the height of the walls of a sukkah. Any remaining doubts that we are in the realm of the absurd? Perhaps you wondered: On what basis could R. Yehudah imagine, let alone validate, the use of an elephant, and where on earth would he get one? (How would he get it to his backyard? Would he tape his kids’ artwork to its side and legs?) While Talmud questions R. Meir’s invalidation of the elephant-sukkah, it doesn’t question R. Yehudah’s permission—it simply accepts it. It is as if Talmud is saying: Sure, use an elephant! No problem. This reveals an underlining sense of fun and whimsy. The primary biblical mitzvah of Sukkot is joy—this is z’man simchateinu (“our season of joy”). Perhaps the Rabbis are here fulfilling the mitzvah of joy through humor. On Sukkot, our world is turned upside down as we move out of our cozy houses and make the fragile sukkah our home for a week. The outside becomes the inside, and the inside becomes the outside. Sometimes circumstance turns our lives upside down or inside out to our detriment. Could Sukkot be a training ground for coping with extreme change?